Angry Bunnies: Colossal Carrot Crusade is a simple action/puzzle title developed and published by Cypronia the creators of Color Zen and Color Zen Kids! The former of the two received an exceptional score in our review of the game, while the latter received a mediocre score when we reviewed the game. How does Angry Bunnies stack up? Is this a quality title worth checking out?! Continue reading this review to find out! 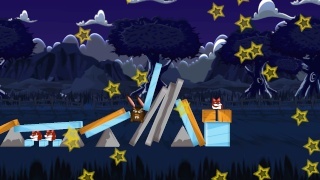 The gameplay is simple yet very challenging, you must launch cute bunnies from a catapult and obtain every carrot in a stage in one attempt by using objects in the stage to hit carrots that are out of reach. 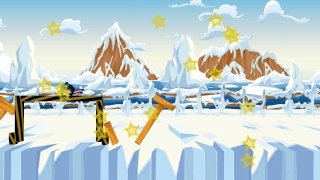 The difficulty level can be incredibly difficult at times and stage layouts can be unfair at times. The gameplay at its best is enjoyable and at its worst can be so frustrating that you'll likely be yelling at the screen. The controls can be difficult to master, but aren't terribly difficult to learn and the Off-TV Play is a nice feature of the game that works quite well! The game doesn't look bad, but there are certainly much better looking games on the service, however they have enough detail that they are passable. The music, while catchy lacks variety and the sound effects are sadly repetitive and annoying, which is a shame given the fact that this game has potential, but somehow manages to not live up to that potential. With gameplay that is fun at times and absolutely nightmarish at others, and a mediocre audio-visual presentation this game had potential to be a solid experience, but failed to live up to that potential every step of the way. The controls aren't overly difficult and the Off-TV feature works great, but overall this game was a let-down. If this was a bargain title under $5 we'd likely cut the game some slack, but at its price it should've been much better. The game isn't terrible, but we still can't highly recommend this title. When I first saw the game title I instantly thought of a card game called Killer Bunnies & the Quest for the Magic Carrot. I was way off! I fixed a few glaring typos. You never give games a score that is this low so this must be really awful. I see that this game received an unsurprisingly low score. This game should have been called Angry Bunnies: Colossal Piece of Shovelware lol. This game looks kinda boring. Shino Asada wrote: This game should have been called Angry Bunnies: Colossal Piece of Shovelware lol.